Mecmesin is proud to announce the achievement of Accreditation to ISO 9001:2015. This is an important milestone in the continuing growth and success of Mecmesin as certification demonstrates the commitment to providing the highest levels of quality and service to customers and distributors. Mecmesin, through its Australian distributor SI Instruments, has launched the first of a new generation of Universal Testers, with a focus on precision control. Its positional resolution of 0.001 mm means the MultiTest-dV offers unparalleled control even for the most affordable entry-level systems. Sophisticated control electronics lie behind its unassuming and stylish control panel, comprising just four multifunctional operating buttons, a clear, bright colour display, and Mecmesin’s unique precision control wheel. The versatile wheel itself enables ultra-fine crosshead control, and rapid crosshead repositioning, whilst doubling up for changing machine settings of speed, set positions, and test type and parameters. The wheel is surrounded by coloured LED lights that indicate the test stand status at all times. Select one of four test modes, and dial in speed and displacement in either or both directions, plus test cycling requirements, and connect a Mecmesin Advanced Force Gauge (AFG) for load limit control. Test speed is continuously variable from 0.1 mm/min to 1200 mm/min, with a resolution of 0.1 mm/min and an accuracy of ±0.2% of indicated speed. Three models are rated at 0.5 kN, 1 kN and 2.5 kN respectively. The 0.5 kN and 1 kN models have extended columns for highly-elastic sample testing, and all three accept Mecmesin’s range of digital Advanced Force Gauges. With an extensive range of standard grips and fixtures, the MultiTest-dV is a robust and versatile testing platform for a wide range of routine testing. The complete range of Mecmesin Closure Torque Testers is available in Australia and New Zealand through SI Instruments. Closure Torque Testing is a measure of the torque force required to either apply or remove a cap or lid on a container. This is frequently a two stage measurement. If the cap is tamper- evident: slip torque and bridge torque is measured. If the closure is child-resistant, a concurrent measure of downward load applied must also be made. Correct performance of container closures is always quality-critical, and in many cases it is safety-critical. Mecmesin’s top-of-the-range Vortex-i Computer controlled torque testing system gives optimum testing performance and evaluation options, enabling you to get the most from your test measurements. 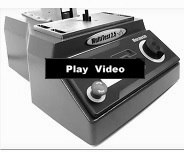 Vortex-xt Touch-Screen controlled torque testing systems enable fast and efficient testing on the production floor. The entry-level Vortex-d Motorised test stands are a cost-effective solution for straightforward torque tests. The new Lafayette Manual Muscle Testing (MMT) System 01165, now available in Australia and New Zealand through SI Instruments, is an ergonomic hand-held device for objectively quantifying muscle strength. The test is performed with the clinician applying force to the limb of a patient. The objective of the test is for the clinician to overcome or “break” the patient’s resistance. The MMT records the peak force and the time required to achieve the “break” providing reliable, accurate, and stable muscle strength readings that conform to most manual muscle testing protocols. The MMT also features interactive menus to allow a wide range of options such as data storage, preset test times and force thresholds to be implemented. While powerful and versatile, the MMT is still small enough to fit comfortably in the palm of the hand. Its ergonomic design allows for both patient and tester comfort while easily conforming to manual muscle testing protocols. The MMT uses a rechargeable lithium-ion battery with a battery life of 6 hrs when powered on and has a range of 0-135kg (300lb/1335N) with an accuracy of ± 1 % over full scale. It is supplied with three easy to change molded plastic stirrups with pads, a power supply/charger, sturdy carry case and a Calibration Certificate. It is microprocessor controlled with an easy to read graphical LCD display with data storage for up to 150 tests in on-board memory. A versatile new PC controlled torque tester, the Vortex-i is now available in Australia and New Zealand through SI Instruments. The Vortex-i brings quality control measurement straight to the point of manufacture. The machine’s simple set-up means manufacturers can test clockwise and counter-clockwise torques of packaging components, such as the application and release torque of screw closures. The Vortex-i is designed for R&D as wells routine measurements, providing users with detailed results data, as well as reporting capabilities, if required. Users have the choice of viewing a graphical ‘live’ display of the test for observational purposes, or multiple test results in tabulated form, to begin making comparisons and, subsequently, to evaluate them in more depth with a choice of calculations. Password protection allows ‘administrators’ to alter test set-up and template design, thereby avoiding any accidental changes to programmable functions. With a selection of models rated up to 10Nm, the Vortex-i completes Mecmesin’s range of 3 motorised torque testing systems, which includes the basic Vortex-d and the tablet PC driven Vortex-Xt test system. Mecmesin Unveils New Torque Tester. New Food Texture Analyser by Mecmesin.